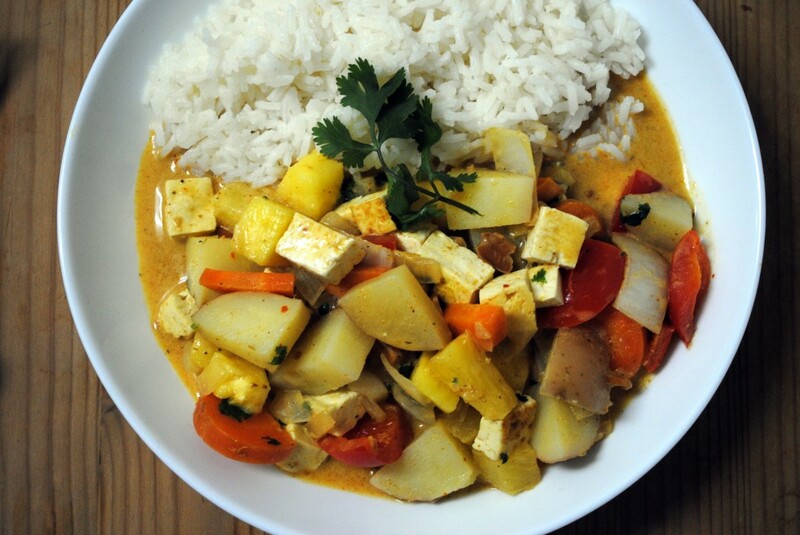 When you need a quick weeknight meal with a little spice (literally) consider a coconut curry in place of your old stir fry or pasta standby. Ideal for a weeknight supper, curries can be made using whatever vegetables and protein you have on hand. Although your pantry might not be stocked with coconut milk and curry paste (mine are, no surprise there) they’re easy enough to purchase and are worth having on hand (I think it’s easier to find coconut milk in Be’er Sheva than in NY!). I’m not going to give you a recipe for this one. I trust that you’ll be able to figure it out by taste. Start by chopping up whatever vegetables you have. 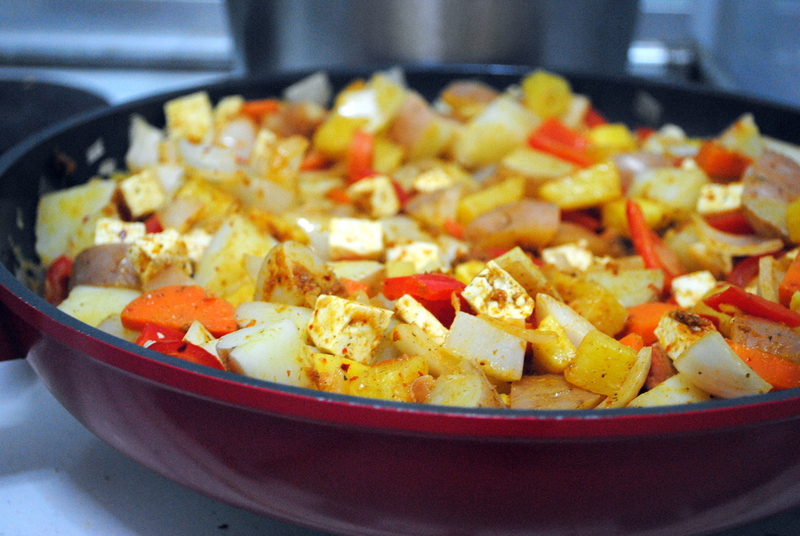 I used potatoes (which I chopped and then par-boiled), red peppers, onion, carrots, and fresh pineapple. Mushrooms, broccoli, corn, any kind of squash or pumpkin, or any root vegetable would also be lovely. If using a protein, cut that into small pieces as well. Anything will work – tofu, chicken, beef, shrimp, or duck would all be amazing. Saute these ingredients together; I used olive oil and a little sesame oil, then threw some chile oil on top; a dash of fish sauce would be a good addition as well if not going the vegetarian route. When everything is nice and cooked, stir in the curry paste (you can use red, yellow, or green) and some curry powder. Since I wanted a spicy curry to alleviate a runny nose I also added chile powder and a teaspoon of this crazy spicy Israeli green stuff. Add the coconut milk. I was making a big portion so used two cans of light coconut milk. Bring to a simmer. Season with salt and pepper. Throw in some chopped cilantro or chives. Serve with Jasmine or Basmati rice. Now that wasn’t so hard, was it?